The suspect in the London terror attack has been identified by local police as Khalid Masood. The 52-year-old was known to police for previous convictions including possession of offensive weapons and public order offences, BBC News reports, but had no terrorism-related convictions. ISIS has since claimed responsibility for the attack that left four people dead and 29 people injured, seven critically. Among those who were killed were a local police officer and Masood. London Metropolitan Police lowered the death toll on Thursday from five to four and revised the estimated number of those injured to 29 after gathering the facts. An American, Kurt Cochran, was among the four people who were killed in London’s deadly terror attack. His wife, Melissa, is being treated for injuries sustained during the attack. The two were celebrating their 25th wedding anniversary. President Trump offered his condolences to Kurt's family and friends early Thursday morning. 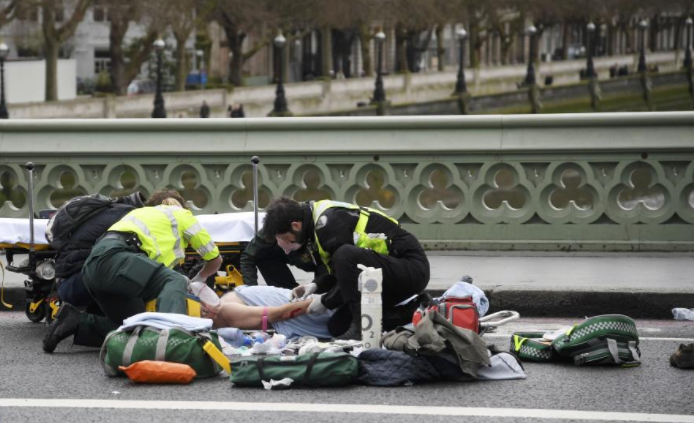 The death toll in the terror attack in London on Wednesday has risen to five people, including a local police officer and the suspected assailant. The number of people reported injured has doubled to 40 as a full-scale counter-terrorism investigation into the incident is underway. The officer killed in the attack has been identified as 48-year-old Keith Palmer, who served the Parliamentary and Diplomatic Protection Command for 15 years. Acting Metropolitan Police Deputy Commissioner and Head of Counter Terrorism Mark Rowley says that it is "too early" to publicly release the name of the suspect in the attack, reports Fox News, but that officials "think we know who the attacker is and are working to establish who his associates are." For more, watch the brief CNN report below. British Prime Minister Theresa May has condemned the terror attack on London as "sick and depraved." May announced that Parliament would "meet as normal" and "come together as normal" on Thursday. "We will all move forward together, never giving into terror," she said. Abu Izzadeen was wrongly identified by Channel 4 News as the alleged assailant in the terror attack in London on Wednesday. Izzadeen is currently in prison. The identity of the attacker is still unknown. Abu Izzadeen, who was wrongly named as the London attacker by Channel 4, is still in jail. Channel 4 admits it is no longer sure. The White House in its Wednesday press briefing condemned the terror attack on London and extended the U.S. government's "full support" to Britain's ongoing counterterrorism investigation. "We obviously condemn today's attack in Westminster which the United Kingdom is treating as an act of terrorism," said Spicer, "and we applaud the quick response that the British police and their first responders have made to the situation." "The victims are in our thoughts and our prayers," he went on. "The city of London and Her Majesty's government have the full support of the U.S. government in responding to the attack and bringing those to justice who are responsible." President Trump has been briefed on the situation in London and has spoken with UK Prime Minister Theresa May. Secretary of State Rex Tillerson issued a statement soon after news of the attack made headlines. “We condemn these horrific acts of violence, and whether they were carried out by troubled individuals or by terrorists, the victims know no difference,” the statement reads. The alleged attacker has been identified as Abu Izzadeen, a man "well known for funding, glorifying and helping organise acts of terror years before the incident at Parliament," Independent UK reports. Izzadeen was killed on Wednesday after mowing down pedestrians on London's Westminster Bridge and attacking police officers as he attempted to enter Parliament, leaving one police officer and two civilians killed, 20 people injured. Of those four people killed, a London police officer and the alleged attacker. Acting Deputy Commisssioner and Head of Counter Terrorism of Scotland Yard, Mark Rowley, held a press conference in Westminster, sharing that local police believes there was only one assailant. "We are satisfied at this stage that it looks like there was only one attacker,” he went on. “But it would be foolish to be overconfident early on." According to Rowley, the incident began when a vehicle mowed down pedestrians on London's Westminster Bridge. The car then crashed near Parliament and one man armed with a knife tried to enter the government building. A full-scale counterterrorism investigation is underway.